High Resolution thermal printer; with manual and automatic modes; one channel (optional: two channels). Paper size: 48mm X 20mm approx. High Resolution with registration on the occurrence of each triggering. The external pacemaker was designed to stimulate the heart in case of disturbances in the rhythm and internal faults in the conduction of its electric impulse. It is used in cardiac surgery as an emergency cardiac pacemaker. Some transthoracic applications for the pacemaker are indicated for: Treatment of symptomatic bradycardia or bradiasystoly, during emergency and during and after cardiac surgery to facilitate the insertion of a transvenous stimulator electrode. External pacemaker, transthoracic, non-invasive, multiprogrammable; on the DEMAND modes, Asynchronous (fixed) and Emergency. 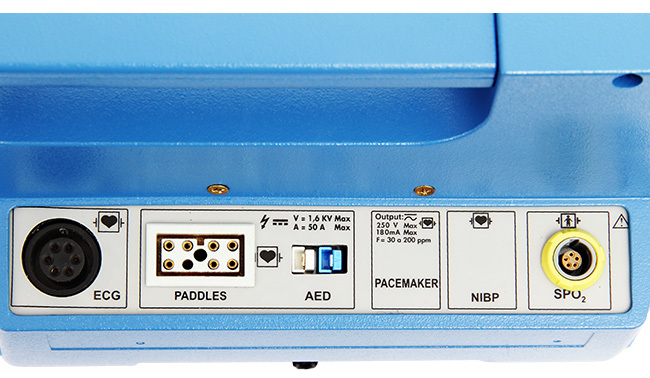 Control of the process of stimulation through the Defibrillator keyboard. The application of stimulation pulses can be displayed by a LED on the panel. It is possible to set the pacemaker in three different modes of operation: VOO, VVI and Emergency. In VOO and VVI modes the pacemaker will be stimulating and transmitting information to the display (amplitude, width, frequency and mode). Stimulation current: without charge connected: 200mA; Off: 0mA. Emergency: VOO 70 ppm – 100mA 20ms. 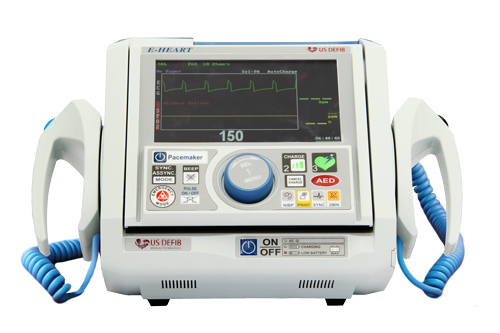 Defibrillation discharge protection: up to 400 Joules. The above specifications (frequency, amplitude and pulse width) can be changed when requested by the user. Pacing Mode: Demand, emergency, fixed rate. Pacing Rate, ppm, 30-200 ppm. Pulse Width, m sec 0 – 50 m sec. 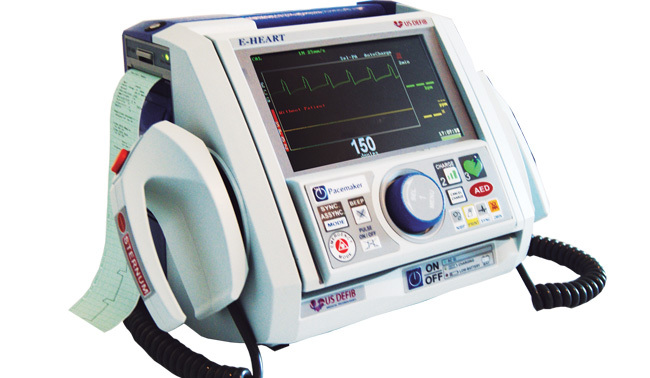 Systolic, diastolic and mean blood pressure measurements; by the oscillometric method in adult, pediatric, infant and neonatal patients; safety and protection in pediatric and child use. In the automatic mode it is programmable from 1 to 120 minutes. Programmable interval for cuff inflating. Auto zero before each measurement. It has alarm for minimum, maximum and average pressure. It has sound and visual programmable alarms that are triggered automatically when you exceed the upper and lower limits of the adjusted values for blood pressure and heart rate, and it has 03 priority levels. Range of heart rate measurement: from 30BPM to 250BPM. Optional: clamp, cuff / hose (adult, pediatric and neonatal). 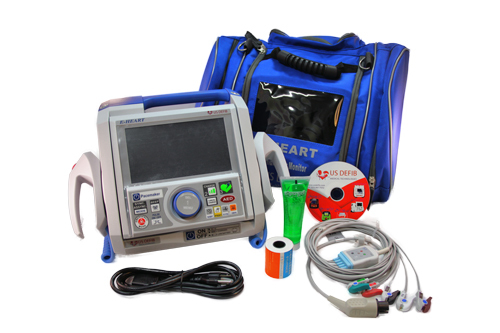 Automatic ECG evaluation, which detects QRS complexes and automatically identifies malignant arrhythmias (ventricular tachycardia and ventricular fibrillation) that require defibrillation. 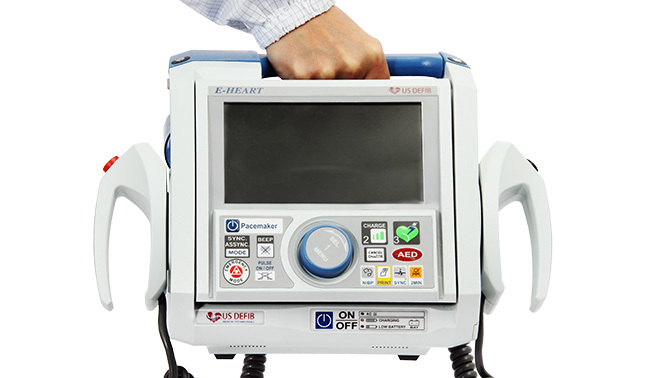 It features voice and text command on the display to instruct the rescuer during the resuscitation sequence. 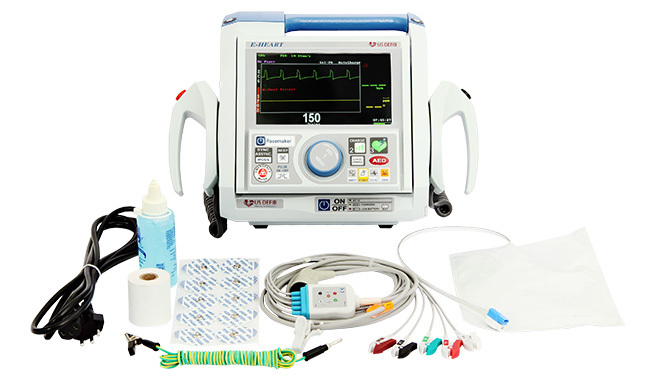 The capnography module uses the sensor “Side stream” and “Mainstream” miniaturized type. After connecting the sensor, it is necessary to wait for approximately 1 minute for the set to be ready for measurements. After this time you should see a light on the sensor indicating their qualification. Once connected to the respirator tube, we’ll have the patient information. The capnography sensor should be placed over the adapter to prevent condensation, if it occurs, it will interfere with the reading measurement. Plethysmographic curve, indication and values of oxygen saturation and pulse rate shown on the numeric display and in percentage; plethysmographic wave amplitude adjusted on the screen; it has full alarm system and audible and visual indication of the SPO2 level, through the tone of pulse signal, the volumes of alarms and audible pulse indicator are independently adjustable, adjustable audiovisual alarm: low and high SPO2 and low and high heart rate (bradycardia and tachycardia); alarm pulse not detected, sensor disconnected; searching for pulse; silencing the alarm for 02 minutes key, good response at low perfusion. Accuracy of 3%. The accuracy of the measured saturation is indeterminate when it is between 0% and 69%. Optional: adult SPO2 sensor clip, child clip, universal Y clip and ear clip. Technical specifications are subject to change without previous notice. Use the form inside to receive a fast quotation from us. To be among the best in the world in providing technology and smart solutions to preserve and save lives. Provide technology and smart solutions to save lives. Receive exciting features, news & special offers! You can unsubscribe at any time by clicking the "Unsubscribe" link in any Newsletter.